We have days on the island, on the lake and the edge of the lake and the edge of the land and the land. The island makes time, the days turn into years. I learn new island languages to navigate the space, to name everything the day leaves behind. I circumnavigate the island to keep its shape, over the rocky shore, through the full middle. I learn flag semaphore and signal the weather with my arms: points of contact. The history of what just happened is left in the shapes I make, so close to words. I go beyond the edge of the island and into the lake, stand on the ground under the water. The island’s edge goes on for miles, my head is below the surface. I almost swim to Canada. My hair dries in the sun. I skim stones for hours. 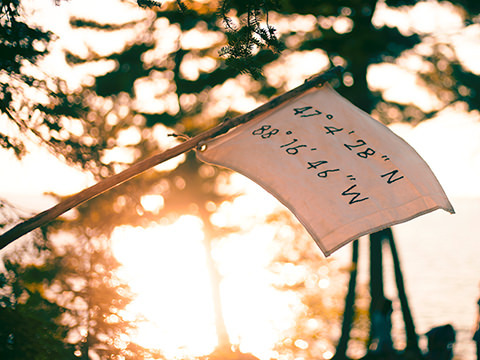 Over the days and in the gaps between everything I embroider the coordinates of the island onto a flag. The map numbers meet the place, meet the new wind. I give it to the island, leave it flying in Monday’s south easterly wind when we leave, in the middle of the day’s weather, everything else just around the corner. Isabella Martin is an artist who uses language to navigate the spaces of our days, asks the questions that lead to the adventure of the next day, and chooses the words to leave behind.